Precious metals futures changed little for a third straight session Tuesday. Gold, silver and platinum fell by 0.1% or less while palladium inched up 0.1%. Gold for June delivery edged down 40 cents, or 0.03%, to settle at $1,313.70 an ounce on the Comex division of the New York Mercantile Exchange. "Gold is still being kept in check by the firm U.S. dollar, which has profited from the widening of interest-rate differences between the U.S. and Europe," MarketWatch quoted Carsten Fritsch, commodities analyst at Commerzbank. "The interest advantage of U.S. Treasurys over German government bonds is at its highest level in 29 years." Gold futures ranged from a low of $1,308.50 to a high of $1,317.70. They dipped 60 cents in starting the week on Monday. Silver for July delivery declined 2.3 cents, or 0.1%, to close at $16.472 an ounce. Silver futures traded between $16.33 and $16.55. They fell 0.2% on Monday. July platinum shed $1.20, or 0.1%, to $912.10 an ounce, ranging from $907.80 to $915.20. Palladium for June delivery added $1.30, or 0.1%, to $963.40 an ounce, trading between $959 and $971. 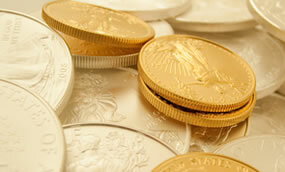 United States Mint bullion sales logged their first gains in May. Combined advances included 6,500 ounces in gold coins and 50,000 ounces in silver coins.